The third of three ‘raptures’. 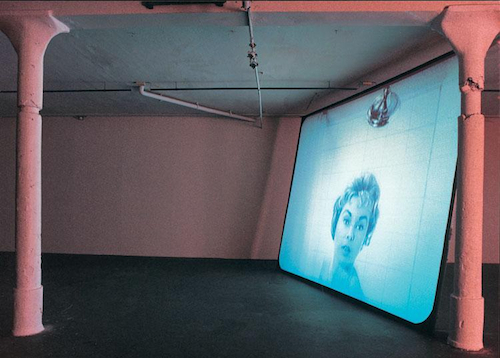 Douglas Gordon, ‘24 Hour Psycho’. Glasgow and Berlin, 1993. MoMA NY 2006. He understands that this film needs to be silent, and black-and-white, for the solitariness of the true cinematic experience, even though, as he knew, he was watching videotape images, which lack the mystic glow of true film stock. What he really wanted was to attend for an entire performance, through all twenty-four hours, alone in the museum, to undergo the ultimate sensation of this ‘radically altered plane of time’ (15). We have all experienced this, leaving the cinema, perception reconfigured by the screen, after Toy Story how the streets appeared pixelated and color-adjusted, and full of automata. Four or was it six curtain rings spin endlessly, toward the stained water circling a shower drain. Detective Arbogast for ever falls backward down the flight of stairs. Outside the installation space, there’s sound and color, ‘the strange bright fact that breathes and eats out there, the thing that’s not the movies’ (19), that white machine. 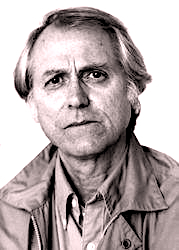 We never learn who this unnamed man is, consumed by a certain conception of motion picture, through the first nineteen pages, ‘Anonymity, September 3’, of Point Omega, Don DeLillo’s 148-page novella. The central narrative then begins. Richard Elster, 73, has retreated to a desert, maybe the Mojave, where there are only distances and where time is ‘blind’ (81); he lives in a semi-derelict shack. ‘The desert was clairvoyant, this is what he’d always believed, that the landscape unravels and reveals, it knows future as well as past’ (109). He drinks scotch with water, from a coffee mug strapped to his belly. He reads mostly poetry, Pound, Zukovsky, his youthful enthusiasms, but Rilke too, reciting aloud from the Duineser Elegien, working on his German. He had spent two years on the ‘third floor of the E ring at the Pentagon’, as a top-level academic theorist, with no experience of war-fighting, logistics, but recruited to provide overall legitimacy for invasion, the ulimate koan of military supremacy, above and beyond the fluid kinetics of any battleground. He operated, he said, in the war room, among all the ‘Bulk and swagger’ (24). He was author of a notorious essay on the etymology of ‘Rendition’, which had brought him to their attention. He was a ‘defense intellectual’. Jessie, Elster’s daughter, arrives; she is enigmatic, an original, though she describes herself as ‘totally disregardless’ (59). Elster remarked that she hadn’t been a child ‘who needed imaginary friends. She was imaginary to herself’ (89). She has had no serious boyfriends, her father thinks, but her mother (from whom Elster is estranged) now worries that she has some involvement with a man who might be a problem. Jessie fascinates Finley, ‘she heard words from inside them’ (50). Her father had told her about his visit to the silent Hitchcock installation with Finley, and had said that it was like watching the universe die over about seven billion years, he had managed ten minutes then fled, without making any remarks to Finley. Jessie chose to go herself, stayed about half an hour. She sometimes talked to strangers. Teilhard de Chardin’s notion of ‘the omega point’ was one such, a final introversion when the human species moves beyond, or back from its biological basis and out of present consciousness altogether. When Elster and Finley return from a trip to buy groceries, Jessica has vanished, taking nothing with her, leaving no letter, simply disappeared, in her disregardless way. ‘Passing into air, it seemed this is what she was meant to do, what she was made for … Had she strayed past the edge of conjecture … ?’ (101). The local sheriff and park rangers make endless helicopter sweeps while they also search for Mexicans brought across the border and abandoned among the parched badlands. A knife is found in a canyon not far away, nothing else. Elster is broken, ‘inconsolably human’ (121). THE FINAL TWENTY pages of Point Omega return to the nameless, fixated viewer in the Psycho room, now the following day, September 4. A woman breaks into his meditation with some pointed but oddly random remarks, she has come straight to the installation, not bothering with the rest of the museum. She was ‘a shadow unfolding from the wall’ (141), and he becomes inwardly agitated, needs to check his appearance, urgently thinks how they might take dinner together somewhere. He imagines pinning her to the wall, as she continues to watch the movie over his shoulder. He follows her out into the streets, they talk some more, and he asks for her number, which she rapidly recites then walks away into the midtown crowds. He returns to the installation for its final half-hour, paying full-price for his entrance. His thoughts begin to afflict him, the guard shoots himself in the head, for instance. He cannot be responsible for these thoughts, he waits to become one with the figure of Norman Bates, before the endless movie has to end. The Web accelerates and intensifies so much of what was being described as ‘postmodern’, but to the point where there is no point in trying to categorize the infinity of data and the potential that it offers. There are moments when you can feel as if you are brushed by, even caught up with, changing times; you come across work which seems utterly new, that can take you immediately to a different level. Film-text has given me some of my most shockingly new perspectives, works that become obsessions over years, even decades: the first sight of a 20-second TV trail for Blade Runner; a late-night C4 showing of Chris Marker’s Sans Soleil; Don DeLillo’s remarkable TV essai, The Word, the Image and the Gun, which surely laid out the development for his fiction from Libra right through to Point Omega. The attempt to describe a new category of culture and affect during the 1980s, the ‘postmodern’, is now of its own past moment. Maybe it is best understood as a birthing process, a labour that would bring forth the current stage, of global virtual exchange, courtesy of the Internet. The Web accelerates and intensifies so much of what was being described as ‘postmodern’, but to the point where there is no point in trying to categorize the infinity of data and the potential that it offers. This will be the mode for the foreseeable future, with ever more integrated transactions between technology and flesh, babes WIFI-readied before they leave the maternity unit, USB implants tucked discretely behind each ear. THE IDEA OF ‘postmodernism’ was a harbinger, a sensing of what was about to be born, it was Juan the Baptist before the final revelation – digitalia and the Web. These have become the true acceleration toward an infinity of the new. What is now most compelling is the planetude of micro-cultural moments, the universe of blogs, the accessing of all areas (an illusion, of course) about which it is frankly uninteresting to theorize within one grand paradigm, unless it is that of the silent supervision, the algorithm within the data stacks, of ultra-state superveillance.5 All of which renders the notion of ‘the postmodern’ as quaint as Jacob Burckhardt’s ‘Renaissance and the Discovery of Man’. Does this confirm the death of postmodernist irony, the infinite play of all that knowingly evasive reference? As in Douglas Coupland’s Girlfriend in a Coma (1998), Adam Gordon ultimately chooses to renounce the conventions by which he was created. Can we read Lerner and Coupland (DeLillo got there first) as voices for the new New movement, the post-ironic, a decisive move beyond the crumbling stockade of the post-, but toward what? Resurgence of a new Naturalism, the return of Realism, even? There is, after all, plenty enough these days to be getting real about. Nigel Wheale is the author of Raw Skies: New and Selected Poems (Shearsman 2005) and The Six Strides of Freyfaxi (Oystercatcher 2010). His academic texts include The Postmodern Arts (Routledge 1995) and Writing & Society: Literacy, Print and Politics in Britain 1590-1660 (Routledge 1999). He lives and works in Orkney. This is the third of three ‘Raptures’ he has created for The Fortnightly Review. Note: Updated 28 July 2014 to correct posting errors. This Fortnightly Review article is filed under the following rubrics: Art & Architecture, Nigel Wheale: Raptures. Publication: Sunday, 27 July 2014, at 21:58.